I wanted to set a block on point in this fashion, so I needed to figure out the size of the setting triangles. I have also needed to figure out making this patch for the inside of another block. So, how do I cut the triangles? 2. Divide 4 inches by 1.4142 =2.82. 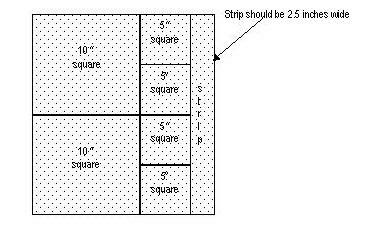 This is the size square (3.25 inches) to cut. Cut two squares. Cut them once each on the diagonal, and you have four setting triangles for that 4 inch center square. 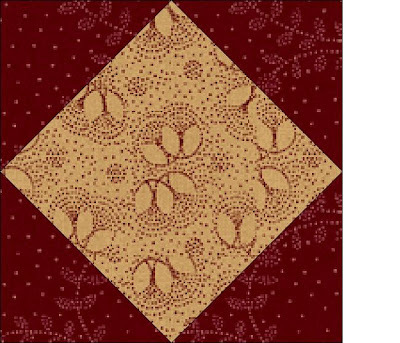 Sew opposite triangles on first, then the other two opposites. A little trimming may need to be done here, and I love the Square in a Square ruler for this, the Easy Angle Ruler or my Wondercut ruler.. All of these rulers have lines that line up with the square in the middle and then let you find the 1/4 seam allowance easily. In my picture above the seam allowance is cut off, as my computer program does not allow me to draw that. You do NOT want to cut off your seam allowance. I found a tutorial on another way of doing this by Bonnie Hunter here. She uses the Easy Angle ruler and has given a chart on sizes up to an 8 inch finished unit. You may find this easier than the math I have given you above if your unit is 8 inches or smaller, but you will need the formula for sure if you have a bigger unit. Both the Math for this and Bonnie Hunter's tutorial will be on the Free Tools section indexed under Pages for future reference.